A Door in a Wall have recently been experimenting with a few different formats, and Memento Mori is yet another departure from their standard events. First, it was sponsored (by the Camden Watch Company); and, second, it was only available for a single weekend. As one of my teammates said, it’s a lot of trouble for them to go to for such a small run. At a shade over 90 minutes from beginning to end, it’s also significantly shorter than usual, which meant everything had to be scaled down. The first example of that was that we only got the briefest of briefings, outdoors. Usually, you’d head to their home base at the start for a theatrical introduction, but there are several slots an evening, so it was presumably in use by earlier teams for their wrap-up. Instead, we met our first character on the street. That worked reasonably well, ironically creating a more intimate feeling, but it inevitably resulted in a shorter and less theatrical performance. Once into the game itself, it became clear that the puzzles on the street wouldn’t be too taxing. While A Door in a Wall never make anything too complicated (aside from the central murder mystery! ), this did feel like we never really had to think much for ourselves. Most of the time we were given clear instruction on what to do, with only one of the three trails involving a puzzle that some teams might genuinely get stuck on. Given the simplicity of the puzzles, you might think that this would be a relaxing stroll, but there really isn’t much contingency. Other than queuing once for five minutes, we kept moving fairly quickly and only got back with a few minutes left on the clock. Expect to have to read the map carefully and be efficient with your interrogations! But not too efficient, because those character interactions were the highlight for me. During your ninety-minute experience, you’ll get to meet or listen to several people involved with the story in a variety of environments. A couple of those performances stood out either because of the way they had been set up or the quality of the improv on offer. With the trails all finished, it was over to a pub for deliberation and cogitation. I found this to be one of the most satisfying stories. Perhaps the smaller nature of the event resulted in a simpler story that we were pretty confident in by the time we submitted our answers (no win, though! ), but I think it just felt satisfying – usually murder mysteries feel like there are a few leaps involved and, while ADIAW do a good job, they inevitably can’t make it too clear-cut! Here it felt like it really was. The finale was probably the weakest part of the evening. With just a single actor involved by then, it felt like we were attending a speech rather than seeing a show. I guess that’s the downside to a more intimate event with multiple sessions – you can’t afford to have several actors on hand for the finale – but I always find the good-cop bad-cop endings the most enjoyable. 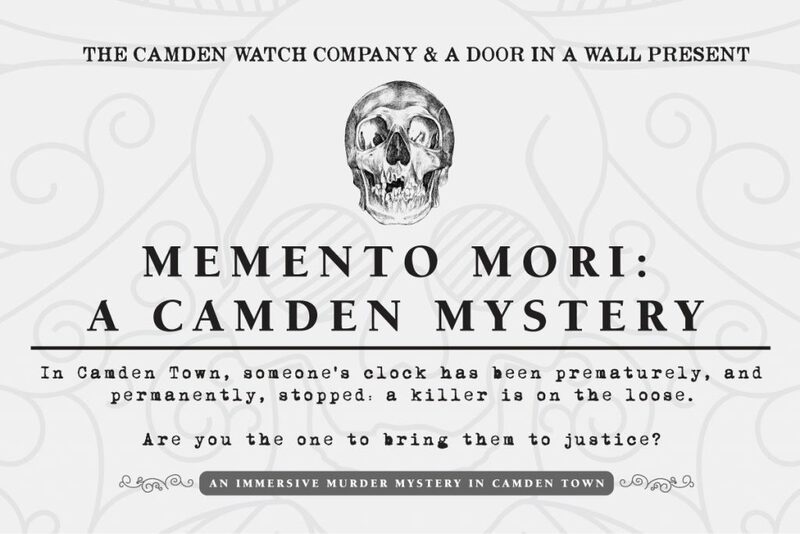 I really enjoyed Memento Mori. In truth, there was very little puzzle-solving to be done, which would usually be a major drawback for me, but the core murder mystery was enjoyable and that, along with a strong theme and solid acting, helped to make it one of my favourite A Door in a Wall shows. Sadly, you’ve already missed the event, but keep tabs on their website because I’m sure it won’t be long before they announce a new game!